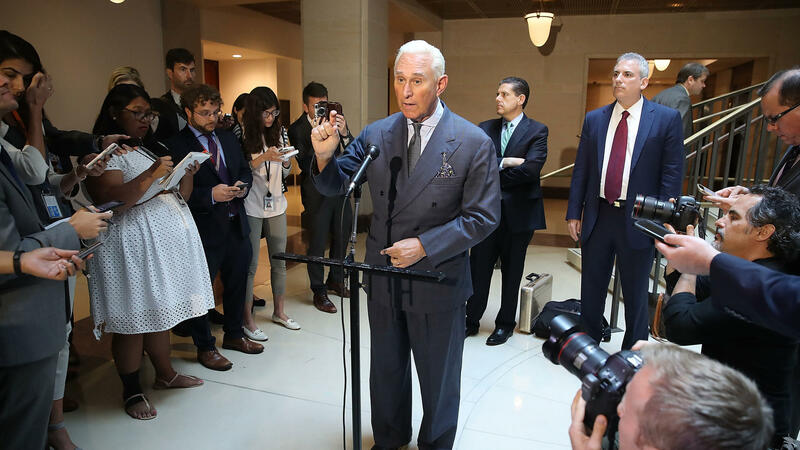 Roger Stone, a longtime ally of President Trump, speaks to the media after appearing before the House Intelligence Committee during a closed door hearing last September. On Sunday, Stone bemoaned the "excesses and partisanship" of Robert Mueller's investigation. Roger Stone, a longtime adviser of President Trump, complained of partisan behavior by special counsel Robert Mueller's investigation on Sunday, but also speculated that he could be under investigation by Mueller for a crime unrelated to coordinating with Russia leading up to the 2016 presidential election. "It is not inconceivable now that Mr. Mueller and his team may seek to conjure up some extraneous crime, pertaining to my business, or maybe not even pertaining to the 2016 election," Stone said, in an appearance on NBC's Meet The Press. Sunday's television appearance came two days after Mueller reportedly subpoenaed one of Stone's assistants, John Kakanis. The development seems to indicate that Stone is increasingly becoming a focus for the Mueller probe. Kakanis worked as a driver, accountant and operative for Stone, according to Reuters. On Sunday, Stone said "at least eight" of his assistants or associates have been interviewed, or as he put it — "terrorized" — by Mueller's investigators. "[The Mueller investigation] was supposed to be about Russian collusion," Stone said. "And it appears to be an effort to silence or punish the president's supporters and his advocates." Stone has been at the center of the Russian election interference story since the summer of 2016, when he predicted, among other things, that Hillary Clinton's campaign chairman John Podesta would soon "have his time in the barrel," shortly before WikiLeaks published Podesta's stolen emails. Stone argues his statements were based off public statements made by WikiLeaks founder Julian Assange, and not off of any coordination with Assange or the Russians hackers believed to have stolen the emails. Those in President Trump's orbit have long been frustrated by Mueller's investigation veering into territory they view as off limits and unrelated to Mueller's assignment. Trump tweeted Sunday morning, "At what point does this soon to be $20,000,000 Witch Hunt, composed of 13 Angry and Heavily Conflicted Democrats and two people who have worked for Obama for 8 years, STOP!" Earlier this year, former Trump campaign chairman Paul Manafort filed a lawsuit against the Justice Department and Mueller, alleging that Mueller had exceeded his mandate by investigating matters unrelated to the 2016 election. When he was appointed, Mueller was authorized by Deputy Attorney General Rod Rosenstein to investigate "any links and/or coordination between the Russian government and individuals associated with the campaign of President Donald Trump" as well as "any matters that arose or may arise directly from the investigation." On Sunday, Stone said neither he nor his lawyer has been in contact with Mueller's office yet.